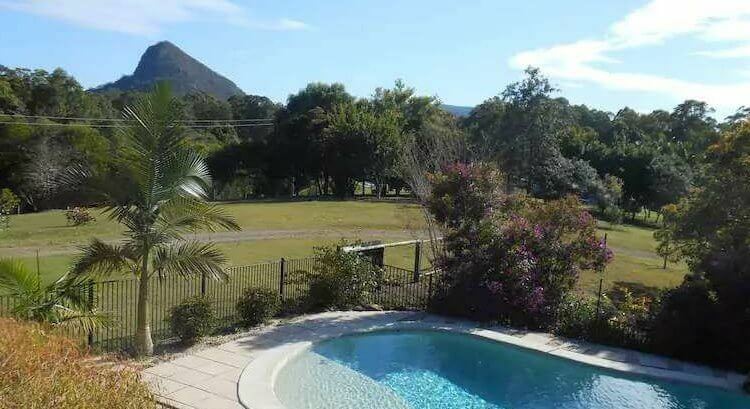 This is a modern contemporary home in the Noosa Hinterland with great views on a 2ha property, half of it is rainforest and has an in-ground pool and is just across the road from the Tuchekoi National Park which is great for walks and adjoins the No. 5 Noosa tourist trail. The home is divided into two separate areas with a private apartment downstairs which consists of large bedroom with queen bed, own lounge, and bathroom. The home includes tea/coffee making facilities, bar fridge and sofa bed. There is plenty of space to relax and take in the sun around the pool, or in the garden. Upstairs there is a deck around three sides of the main lounge room which offers great views of Mt Cooran (wonderful to watch as it changes colours at sunset) and guests are welcome to use this area for drinks and relaxation.